I spent Christmas Day with my niece Louisa and her family in Marlow, first picking up Val in Henley on the way. Lunch was delicious. 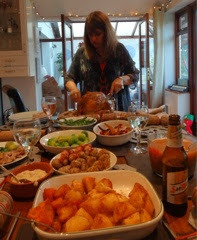 Here's Louisa carving the turkey. 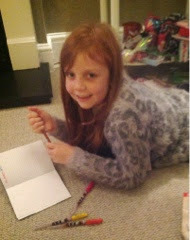 And this is Kate, my eight year old great niece. Kate is a really interesting and talented little girl. Her ambition is to become an author/illustrator. And by the twenty page story she wrote for her mother I'd say she's well on the way to achieving it. She wrote a few more pages in the evening. Guy took a photograph of me when I fell asleep later in the evening which I'm sure is too horrendous to ever be seen in public. Later, while we watched television, Kate and her teenage brother played together in the next room where peals of laughter kept erupting. "What sort of game are you two playing?" I asked. "It's a game where you mustn't laugh" said Kate. 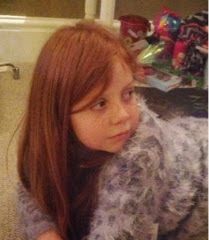 One of Val's presents was this fur-collared cape. 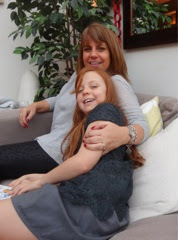 And here's Louisa with the budding author. Today - Sunday - I'm in Suffolk, staying with my young friend's parents. 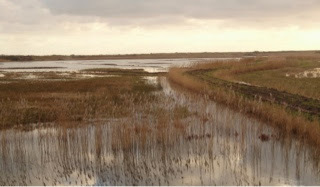 The sunshine was sparkling today so we made a visit to Minsmere nature reserve. 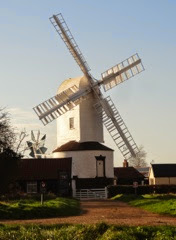 On the way we passed Saxtead Green post windmill. ("Post" meaning the whole top turns round - not just the sails. We were hoping to see a murmuration of starlings today at Minsmere. This usually happens just before dusk but today we were told that they moved away a couple of weeks ago to another location. Nevertheless we walked around the reserve with our binoculars and visited three hides. There weren't too many birds around today. Here's a view from one of the hides. 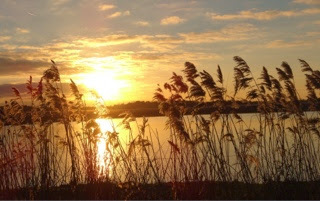 We walked back through the woods until sunset appeared through the reeds. I'm a garlic hater, so imagine my surprise when we went to lunch the other day at The Quince Tree near Henley. I had the most delicious Thai fishcakes which after we got in the car to go home my young friend remarked that I reeked of garlic! I still hate garlic - but it certainly cured my indigestion. Just before Christmas we went over to Woodley to pay a visit to my cousin, Jill. 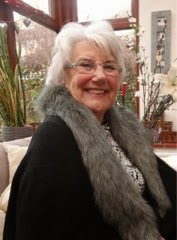 When I was thirteen, during my mother's illness, I lived with her family in Wokingham and it was Jill who taught me to dance (ballroom, that is). 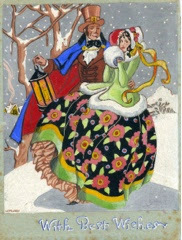 So it was a great surprise when she gave me a Christmas card she'd found that I'd painted and given to them at the time. Here it is. Contrast this with the 5 inch wide miniature I painted a month or so ago. 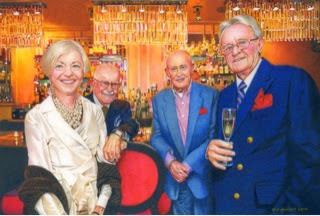 I haven't posted on my blog till now as it was a Christmas present to the lady on the left of the painting from the man on the right who commissioned it. As I had to get perfect likenesses of all four people - and the face of the man in the middle measured less than half an inch high - it wasn't an easy task. The chandeliers and wine bottles in the background weren't that simple to paint either. Still on the subject of painting this was my Christmas card for 2014. 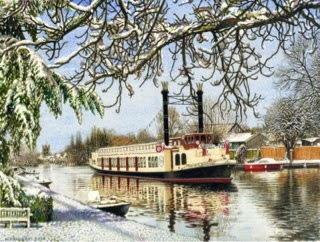 It's a painting of "The New Orleans" riverboat majestically proceeding down the river in the snow. Finally, having spent the past couple of months painting two very large portraits in readiness for submission to the BP Portrait Award at the National Portrait Gallery in London I was horrified last night when rereading the entry regulations to discover that watercolour paintings are not eligible for some reason. Only oil, acrilics and tempera mediums will be accepted. This is the first time I've ever heard of this type of restriction in a major open exhibition. I'm very disappointed but with only a few days left before submission date, maybe I have time to at least try to get one of my portraits into the Royal Society of Portrait Painters annual exhibition.